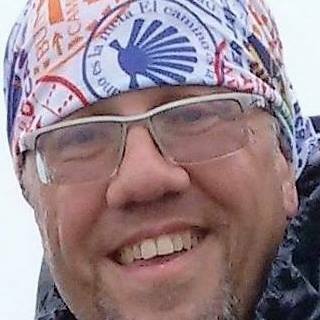 James Portelli, the route reporter for Camino Inglés, came to a crossroads in his life before he walked his first Camino. I am happy to announce that James and I are continuing our collaboration, the result of which is a series of guest posts about his journey to be published here every Sunday in July. In this first post, James contemplates his big move, his father’s turning eighty, his children’s successes, his and his wife’s twenty-fifth wedding anniversary, and a departure from his workaholic ways. 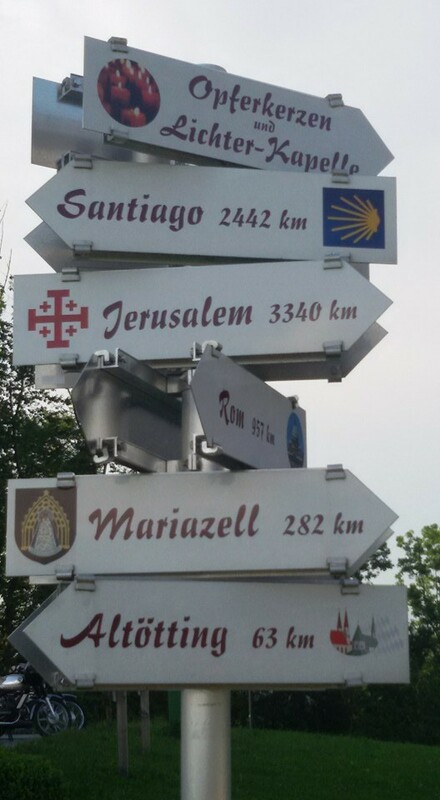 The starting point of the Camino is wherever pilgrims start their journey. 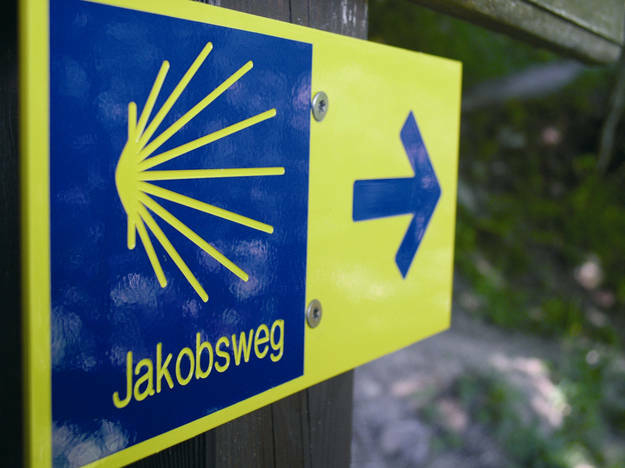 One of the possibilities is to follow the familiar yellow and blue arrows throughout Germany and Austria and thus walk along Jakobsweg (Way of St. James), as the Camino is called in German. The route converges with the Camino Francés, as shown in the map below. Siezenheim is located near Salzburg, Austria, and is close to the border with Germany. 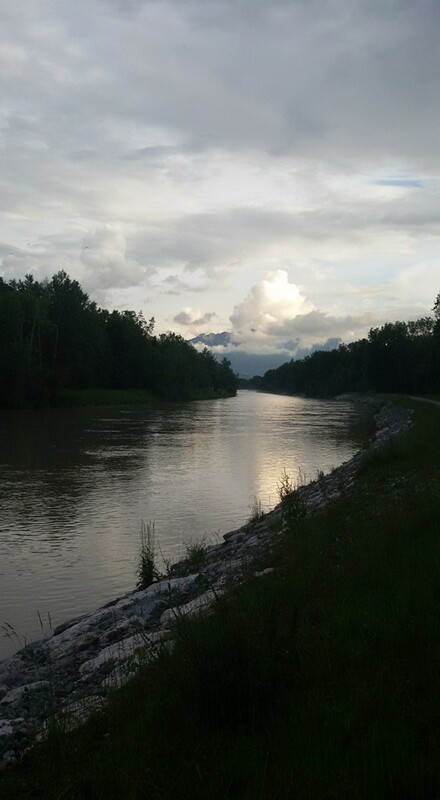 After landing in Salzburg, I dropped my luggage at Gasthof Kamml (guesthouse), put on my walking boots, and headed toward the river, which—incidentally—acts as the border between Salzburg and Bavaria. 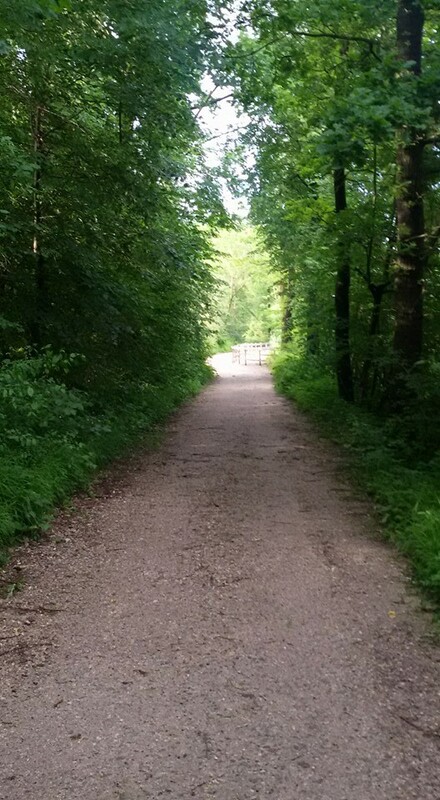 I crossed the bridge at Siezenheim and strolled along the Bavarian riverbank, absorbing the “moving” experience. “Moving” best describes the internal and external state of play, that is, steady pace, the sound of rustling leaves, transient water, a setting sun, an evening breeze, and my mind on the move as I was thinking of the week ahead in a new job and in unfamiliar surroundings. At Allerberger Landgasthof I sat down for a hearty meal before retiring for the night. I opted for a Tyrolean goulash. It was the closest to a homemade, slowly cooked beef stew. I’m not quite sure whether this is indeed an unadulterated Tyrolean dish or whether it has, say, Hungarian or Italian roots. The origins do not really matter; a wholesome stew is a wholesome stew, appreciated by many (myself included). The service at the restaurant was great—attentive but not intrusive. The extended dinner gave me time to clear messages and notifications. It also provided food for thought for me to later pen this piece and another three that follow. I am on the threshold of a new, interesting, challenging job. This made me look back over the past couple of years of this journey called life. Year 2014 was our last full year (out of seventeen) spent in the Middle East, and last year was our first whole year back in Europe. I am not one to dwell on the negative, and so I will just label year 2014 as “interesting.” That being said, that year was not devoid of good things, one of which was my father turning eighty. It was gratifying for him and mum to be surrounded by their loved ones; the endorsement of their love for and commitment to each other and their family was now reflecting back on them in affection. What’s more, our son started his PhD and is now about a year away from completion, while our daughter started her BA (Hons) and graduates next year. Both live in the UK. Both flew out of the nest. Both make us proud. Year 2014 was also our jubilee year—my wife, Tucc, and I celebrated twenty-five years of marriage that December. I think I need to correct myself—year 2014 was much, much more than just interesting. With all its challenges, it was fulfilling; it was a blessing from above. And that’s how I will remember it. Moving houses is by far one of the most stressful affairs. Moving countries and continents (especially after seventeen years) makes it even more stressful. At the beginning of 2015, I also acknowledged that until then I had been a task-oriented workaholic. That had to change. At the turn of 2014 and 2015, while still in the Middle East, I conceived a few simple, tangible, achievable, and more perpetual resolutions, which I then called bite-sized and digestible. to do so in the life chosen for me, that is, of a spouse, a father, an industry professional, and a layman in my designated walk of life. The three pieces that follow this post focus on some of the above resolutions and briefly touch on my experiences in Salzburg, particularly on the Jakobsweg that traverses Salzburg en route to Santiago de Compostela. Life is a journey, not a destination, so please do stop occasionally to smell the flowers, feel the breeze, and sense the spirit within and around you. But above all, keep walking. Keep smiling. Keep safe.